The Thrifty Groove: "Sunday Favorite"
Hi everyone! 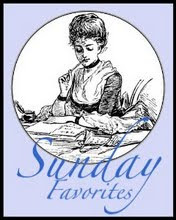 Today is Sunday and that means "Sunday Favorites". This meme is hosted by the charming Chari at Happy to Design. Every week she invites us to revisit an old post. This post was written early on in this blog. I wanted to show that some simple things can help get you through some rough financial times. Most of these things are simply second nature to me whether it be good times of bad times. They are just a way of life. Would you be okay if you or your spouse suddenly became unemployed? There are a few simple and easy things to do now that will seriously help if either of the above situations should happen. 2.) Keep your credit cards paid up and minimal balances on them. 4.) try to build up a "living emergency" fund. Most people say between 3-6 months of living expenses. 5.) Cut out extras in your life that are not necessary. It's easier to do when it isn't absolutely a must. The above list is very common and I am sure you have heard them a 1000 times in the past. It doesn't make them less important. Now for a list I feel helps improve your financial life as well. 1.) Make sure you maintain your car(s). It is much cheaper in the long run if you are always on top of simple things like, checking your fluids on a regular basis, getting your oil changed every 3000-4000 miles like clockwork, checking your air levels in your tires. These are all very simple things that we can all do. 3.) Plant a garden. You don't need a lot of land to do this. As a matter of fact, you do not have to have any land. Do a container garden if your are a renter. There are lots of websites out there to learn how to do this. 4.) Get familiar with the world of bargain shopping and using coupons. Once again, there are lots of sites out there to help you along. 5.) Try a lower price version of things you normally buy the brand name. 7.) Check sites such as Craigslist and Freecycle regularly. 10.) Try beauty colleges for haircuts and hair dying. 11.) Take free community classes or free online classes to learn a new skill that may be able to earn you money in the future if you want to or need to. 13.) Buy clearanced "out of season" items to use for gifts throughout the year or for next years holiday presents. 14.) Organize! This is a biggie. Knowing what you have where it is and are able to get to it when you need it is a major money saver! 15.) Check out local businesses and see what kind of part time help they need at different times of the year. A few hours a week will not only help you build your savings up now and pay of debt but, there may come a time when you need to work full time and you will already have a job that may offer you full time work. 16.) Don't automatically throw out something that is broke. Try to fix it or use it in a different way. You may possible know someone who could fix it for you. this is a great way to hone your bartering skills. ** Go to the library for books, movies, newspaper and magazines. ** Check out free events, classes and sales at the churches in your area. 18.) Start making and using your own homemade cleaning products. 19.) Take care of things you already own. Make sure clothes are mended and ironed, clean and polish your shoes and purses, keep your appliances dust and dirt free. 20.) Instead of going out to eat, once a week go and have a picnic. If the weather is bad, spread a blanket in the living room and have a picnic there. I love all your tips ! We live most of those tips! Well we try. This is very good advice no matter what your income is. Fabulous post, my friend!!! I have really been enjoying all of this terrific information that you've been sharing with all of us for Sunday Favorites!!! Soooo many great tips! I loved tip #13...about buying end of season clearance items and use them for gifts the following year! I do this every year...shop the after Christmas clearance gifts...like gift baskets, etc. I usually buy several and keep them on hand for gifts! You can get some really great gift baskets for just a fraction of the cost this way!!! Thank you so much for joining in with Sunday Favorites again this week, my friend...loved this post!!! Very practical and sensible tips. Thanks for sharing them.